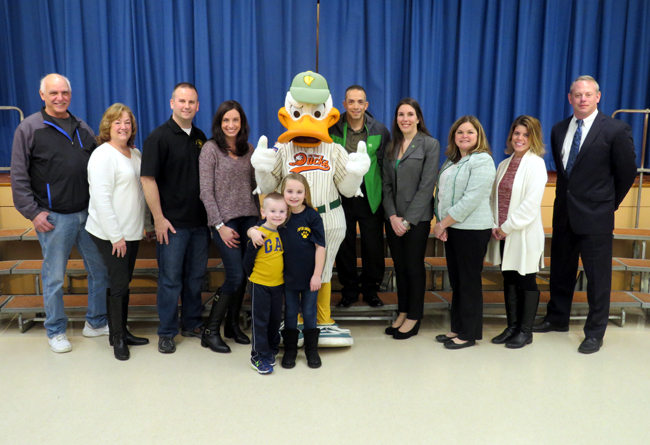 (East Northport, N.Y., Jan. 12, 2018) – On Friday, January 12, the Long Island Ducks made their first school visit of the year as part of the annual TD Bank “Take a Duck to Class” essay contest. Megan Heffernan, a third grade student at Fifth Avenue Elementary School, was honored for submitting a winning essay on why her father, Daniel, is a hero in her community. The school’s third grade class attended an afternoon assembly to honor Megan for her outstanding work. Members of the Ducks Street Team and representatives from TD Bank expressed their admiration for her writing. Megan was presented with a $50 Visa gift card by Eric Fishon, TD Bank Vice President of U.S. Field Marketing & Strategy, and Jennifer M. Arnold, TD Bank East Northport Store Manager. She was then invited up to read the essay aloud to her fellow students. Daniel is a veteran of the United States Army, serving a tour of duty in Iraq. In addition, he is the Chief of the East Northport Fire Department as well as a police officer. He attended the school visit and answered several questions from Megan’s classmates about his various important roles. Long Island’s favorite mascot, QuackerJack, was welcomed by the students to wrap up the assembly. Megan’s class then enjoyed a special autograph and photo session with QJ in their classroom. Each student received an autograph from QuackerJack as well as an exclusive gift bag, courtesy of TD Bank. TD Bank “Take a Duck to Class” contestants were able fill out applications on LIDucks.com last fall and submit an essay of 250 words or less on the theme “Who is a hero in your community and why?” Four lucky winners were selected from an entry pool that included thousands of essays. Each winner receives an hour-long visit to their school from QuackerJack and the Ducks as well as a Visa gift card from TD Bank.